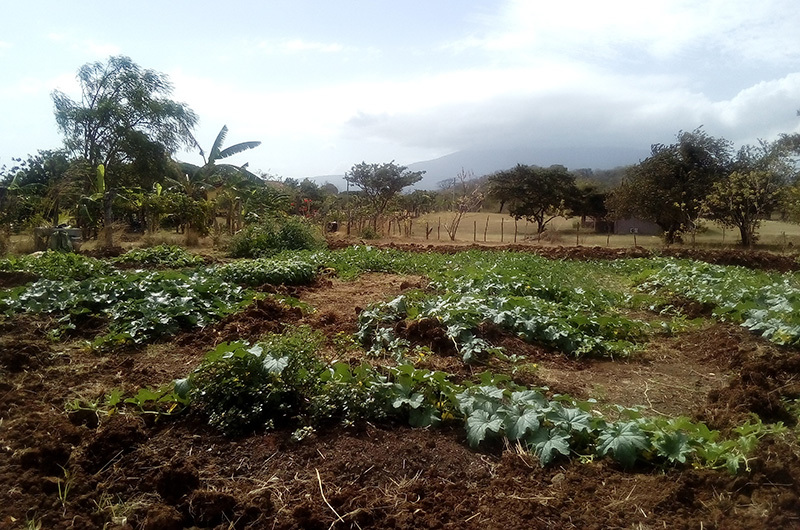 Before the equatorial sun reaches the point in the morning sky where the heat builds and hits you like a forge, I cycle up into the pastured hills to check on my new garden. I was fortunate when a friend offered me a fenced plot located on his property overlooking the colonial city where I could break new ground. I didn’t realize it until later, but tending a garden was the missing piece in an otherwise full life. Breaking new ground is a nice metaphor but even nicer when applied literally. And I was more than ready to begin. I worked the soil for 10 years in West Tisbury and for more than 20 years in Chilmark before leaving the Island. I was always hauling endless loads of manure, mucking out barns, double digging beds while encouraging the earthworms to pitch in with the effort. Sometimes when I was bent over a garden fork or wrist-deep in soil, I wondered about the massive glacier that formed the terminal moraine of Martha’s Vineyard that created the varied soil types and tossed boulders here and there the size of houses. When you garden long enough, you can’t help but think about time and the natural processes slowly at work all around you, the never-ending process of growth and decay and things much bigger than yourself. You also think about late frosts, insects, invading deer and all sorts of other maladies that seem to lurk around every corner. At least in Nicaragua I didn’t have deer to worry about since the flimsy barbed-wire fencing was adequate to keep the neighbor’s cows away. This new garden was noticeably different than my Vineyard gardens. The plot lies a few miles from the Mombacho volcano, which is considered active but hasn’t erupted since 1570. Nicaragua has 19 active volcanoes and its fertile soil was created eons ago by liquid magma spewed from mountaintops. The soil is a beautiful brick color, but during the dry season it becomes just as hard as brick. There are two seasons here: rainy and dry, and it will be months before the rains come. After two days spent cutting the grassy plot with machetes, the landowner had a team of oxen brought in to plow the area to get me started. Oxen are a standard piece of operating equipment in these parts, but the brace of beautiful, gentle animals could barely scratch the surface. For two days they dragged a wooden plow that looked like it had been borrowed from Fred Flintstone. They lumbered back and forth steadfastly but could barely penetrate an inch deep before we decided to abandon the effort altogether. For the next month three hired hands dug beds, five-foot square and a foot deep. Every few days they hauled composted horse manure from another neighbor’s property in their homemade horse-drawn wagon. It was slow and grueling work. A shovel wouldn’t penetrate the soil, so they used a pick-axe and a heavy steel bar to break up the soil into hard nuggets that were painful to walk on. One of the men worked barefoot, wielding the pick-axe while the other two excavated the loosened rubble with handmade shovels that showed signs of being repaired many times. The handles of the shovels were crudely fashioned from a tree limbs, so short and crooked that the only thing they were useful for was inflicting serious back pain. They worked six half days a week for an entire month and dug 60 beds in all. When they were finished, it looked like a newly dug series of graves with the amended soil piled in neat mounds. Six weeks have passed. The hilltop garden sits in a windy spot and the dry season is also the windy season, so I water every day. It’s a 20-minute mountain bike ride from my house up to my new garden. Within half a mile the paved road ends and the roads turn to dirt. The floors of the ramshackle adobe houses clustered along the side of the road also turn to dirt. Laundry hangs drying outside, emaciated dogs lie listlessly on the dusty ground, children play, pigs root and hens peck. In the early morning people sweep the bare ground, making piles of fallen leaves which will be burned. Further on there are fewer houses and garbage is piled along the roadside in heaps. It too will be burned but the pleasant smell of burning leaves is replaced with the toxic stench of burning plastic. Plastic bags are also used as kindling to start their cooking fires, a sad reality of life in the Third World. Today on my ride up to the garden I caught a whiff of something that teleported me instantaneously back to Martha’s Vineyard: The unmistakable aroma of skunk. I asked people about skunks in Nicaragua before and mostly got shrugs. They call skunks zorros but that translates as fox, so I wasn’t quite sure until today. Somehow it was comforting that my old Vineyard nemesis which in later years became a friendly and playful summer companion of mine had relatives living this far south. The garden seems to be prospering. Things grow fast here. It is generally too hot for earthworms to thrive, but I’m starting to harvest all sorts of familiar greens while I watch the melons swell under the hot sun. I never had much luck growing sweet melons on the Island, but here the sun is fierce for months on end so the prospects are better. I miss my old garden at Fiddlehead Farm in West Tisbury. Having to leave it after 10 years was extremely painful, but breaking new ground has allowed me to let go. I’m anticipating a new harvest now. With a hose in hand, I look up from the stream of water to the ragged top of the volcano looming over me and for the first time since leaving the Island I can reminisce about my Vineyard garden without sadness. I think about picking perfect, sweet melons, cherry tomatoes and golden beets in the coming weeks. I wonder about the enormous power of glaciers and volcanoes and the curious way my life has been shaped by the symmetry of fire and ice. A former longtime resident of the Vineyard, Robert Skydell lives in Granada, Nicaragua. Thanks for this nice piece, Bob. I sometimes wonder what I'd do if I had to garden elsewhere. You open a tropical window! Thank you for your beautifully written letter describing your new life in Nicaragua. Certainly a big difference from life on the Vineyard. All sound so familiar to me after having traveled to Costa Rica, Guatemala, Belize, Mexico and Panama several times. All beautiful countries with a variety of environmental differences and challenges to successful gardening. Volcano's, excessive heat, dirt roads, ramshackle houses, hanging laundry, pigs and chickens in yards, emaciated dogs and burning leaves/garbage were usual sights. While there is poverty, there is also an abundance of beauty in the people and nature there. I loved my travels in Central America and admire your determination to relocate and even garden in Nicaragua. Would love to see more pictures and stories of your experiences there. Exquisitely written, only Bob how could you have not realized this vital missing piece of your truest nature for one second even ? Looking forward to reading more of your noticings /poetry/prose/plantings ! Hey Bob - turns out you are as good of a writer as you are a gardener. It was great to see and read about what you are doing. Send some more occasional pieces about Nicaragua - very interesting. good luck! Nice to hear from you Bob. I have been gardening here in Alaska for 13 years. Or should I say trying to. Good Luck. Wonderful to read about your new life, Bob. You always were extraordinarily creative and I am glad you are finding ways to continue your passions. I have just sold my Solviva Farm which became way more than I could handle, physically, mentally and financially, and am now living in VH, on a whole acre in town. It's a 1950s energy-hog that I am now in the process of transforming into a near-zero fossil-fuels, near-zero carbon footprint, and a small version of Solviva greenhouse for energy-selfsufficient year-round food production. We do keep going, Bob, and I wish you all the best. I'd love to hear updates from time to time. Bob, we talked very briefly one day,when you had your store in oak buffs, then you out on to state rd in west tisbury. I thoroughly enjoy reading about your experience in South America. Live your life my friend,so that you have know regrets at the end. Thank for sharing. I can picture you smiling in your new garden. Grateful you have "broken ground" there and I admit I'm a little bit jealous about the sweet melons. You are very missed here on the island. Blessings on your new plot. Gardens always bring out the best in all of us. Enjoy the very best it has to offer. Cheers my friend!